RiverRun’s newest cabinet style, Mt. Vernon Snow, answers consumers’ demand for simple clean styling that pairs beautifully with personal touches whether subtle or ornate, creating a dynamic kitchen. Mt. 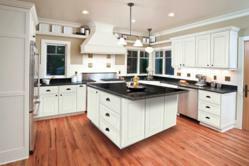 Vernon’s snow white cabinetry offers a fresh clean look that is effortless and is perfectly suited for custom accents. The cabinetry can be used as a beautiful centerpiece for consumers’ kitchens or as the perfect backdrop, setting the stage for other unique accents such as RiverRun’s decorative accessories or paired with artistic tiling and high-tech appliances. Mt. Vernon Snow’s versatile styling brings a spirit of openness and energy, cultivating inspiration and allowing consumers to create a custom-look, making the room their own. Mt. Vernon Snow is the second addition to RiverRun’s cabinet styles in the past year. RiverRun will begin accepting Mt. Vernon orders on April 1, 2012. “We are always looking for products and opportunities to better serve our customers and believe both our dealers and the end consumers will be very happy with the new Mt. Vernon Snow style and quality,” says Chad McGlaughlin, RiverRun Cabinetry President. RiverRun continues to offer the same great value in all of their products, inspiring consumers to create their dream kitchen. Quality and affordability are built into every style, including many features which are considered upgrades in other brands. For more information about the new Mt. Vernon Snow line please visit http://www.riverruncabinetry.com or call the customer service department at 540.438.5973. RiverRun Cabinetry is located in the beautiful Shenandoah Valley of Virginia. Our mission is to deliver a naturally beautiful, fully featured line of cabinets where the quality reflects nature’s finest, where traditional craftsmanship and modern efficiencies come together harmoniously to create beauty and quality in a line of cabinetry that offers the very best value possible.